You may have suffered chronic pain on your face. The pain is severe excruciating. It is a shooting pain and similar to an electric shock on your face. Your doctor told you that you are having trigeminal neuralgia. So, What is trigeminal neuralgia? Trigeminal nerve is the nerve within the brain. It is responsible for the sensation of your face to brain, and the movement of bitting and chewing. 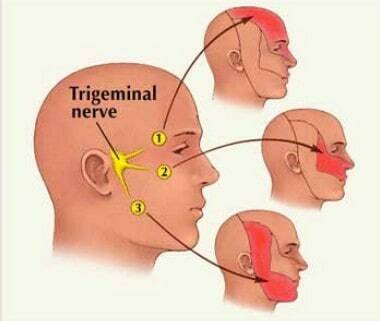 Trigeminal nerve has three branches located on the face and response for the corresponding area (see the image). Neuralgia means nerve pain. It is a severe pain. The pain can be stabbing, sharp, burning. Trigeminal neuralgia is one of the common nerve pain on face. Trigeminal neuralgia is commonly affect middle aged or elderly patients. The common age of trigeminal neuralgia is 40 year old. Women suffers more than men. It is more common on the right hand side of face. Sudden onset of severe pain from one point on your face, mouth or jaw. The pain is a cutting, burning, stabbing or electric shock-like pain. Pain can be triggered by talking, eating, washing, or brushing teeth. The pain normally lasts from a few seconds to a couple of minutes. With the disease progressively getting worse, pain can be severer and the onset can be more frequent. There is less pain at night. Because there is no sign before pain attacks, you may very anxious and be afraid of talking, brushing teeth, eating. Your mouth may deviated to one side due to pain and spastic twitching of facial muscles. In the early stages of trigeminal neuralgia, it’s common to have flushed face, red eyes, teary and running nose. Sometimes you may try to rub cheeks to ease the pain, by doing so you have rough skin on the face, and sparse eyebrow. What causes my trigeminal neuralgia? It could be a blood vessel pressing on the trigeminal nerve where it meets brainstem. Other causes including multiple sclerosis or tumor compressing the trigeminal nerve. If no underlying conditions are found your doctor may prescribe some drug for the pain. They are generally anti-convulsants. What about Chinese medicine or acupuncture? Traditionally acupuncture and Chinese medicine have been used for facial pain. They offer an alternative natural approach for pain relief. Acupuncture – Traditional acupuncture or electro-acupuncture may used during your treatment. Chinese herbal medicine – Depends on the severity of the pain, and frequency of onset, your practitioner may suggest some Chinese herbs for you. Relieve pain – There are some researches showed that acupuncture can reduce the pain from trigeminal neuralgia. Depends on the distribution of the nerve pain, we may choose different acupuncture points. Is acupuncture painful on my face? You rarely feels the pain. Sometime you may feel a little dull ache or slightly tingling sensation. It is actually relaxing. Is acupuncture safe on may face? If performed by well trained practitioner, there is rarely any adverse effect of acupuncture for trigeminal neuralgia. We only single-used disposable needles at all time.